DUNCAN, Okla. – For Scott Grover, it all comes down to the competition. Grover is the arena announcer for the Chisholm Trail Ram Prairie Circuit Finals Rodeo, and he’s excited for the start of the three-day championship, set for 7:30 p.m. Thursday, Oct. 17-Saturday, Oct. 19, at the Stephens County Fair and Expo Center in Duncan. 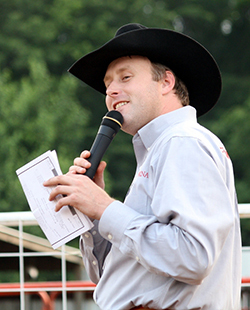 Scott Grover will announce the Ram Prairie Circuit Finals Rodeo for the sixth time in his career when the regional championship takes place Oct. 17-19 in Duncan, Okla.
“I’ve always said the Prairie Circuit Finals performances are as good as any major rodeo in the country,” said Grover, who will call the action at the circuit finale for the sixth time in his career. “We’ve got NFR qualifiers, world champions, but then we’ve also got those guys that are strictly circuit cowboys. They have jobs, and they spend their weekends on the road. In fact, that’s why the circuit system was developed nearly four decades ago, to provide a regional championship for those who are considered “weekend warriors.” Cowboys and cowgirls battle all season long, competing at rodeos all across the Oklahoma-Kansas-Nebraska region with Destination Duncan on their minds – only the top 12 on the money list in each event at the conclusion of the circuit’s regular season earn the right to compete inside the expo center. That’s important, but there are many aspects of Grover’s job during the performances that are vital in relaying information to the fans. He also will be part of the mix in making the production of each performance as best it can, working closely with rodeo clown Keith Isley throughout the two-hour show to help fans enjoy every moment. Knowing the entertainment value of rodeo, particularly a championship like the Chisholm Trail Ram Prairie Circuit Finals, is just one reason Grover is excited to be part of the festivities. Circuit titles are goals of every contestant in the field. Not only is the circuit finals’ crown on the line – the contestant in each event with the fastest cumulative time on three runs or the best cumulative score on three rides will earn the average title – but also cowboys and cowgirls will battle for the year-end championships.